There are lots of beauty products that offer Acne Solutions that will easily remove bad skin in just a couple of weeks. 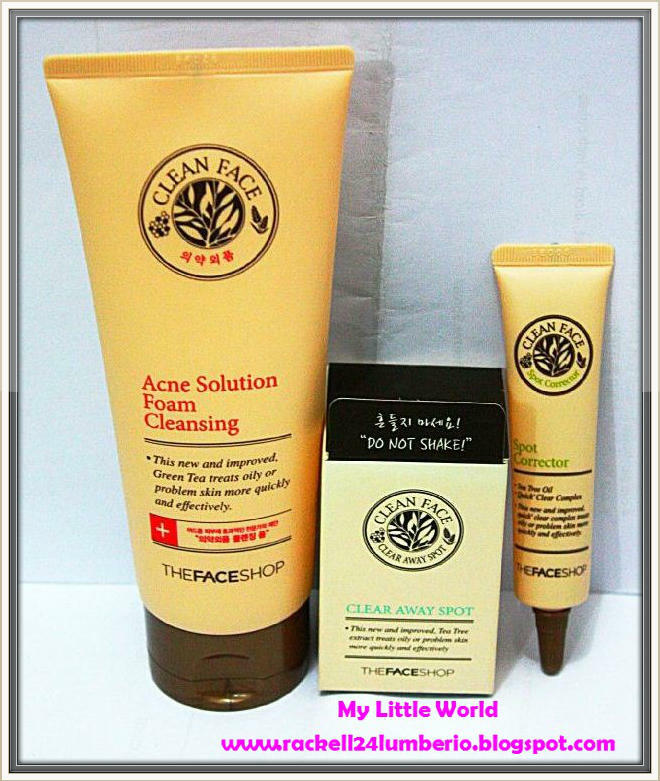 Honestly, I don’t trust any brand except for Pond’ not until we purchased Acne Solution Foam Cleansing at The Face Shop. It was unplanned to purchase this beauty product, last night after we watched “Skyfall” I asked my husband to stroll around Glorietta, and got surprised when we found out that it was Mid-Night sale. Wohooo!!! So we saunter around and I asked him to check The Face Shop, actually my only plan is to check their BB cream but unfortunately, we ended up buying these three products that they offer. We just switched from Pond’s Facial wash to Acne Solution Foam Cleansing. This product is designed to minimize oil secretion and fights acne at its source by removing build-up and impurities that clog pores. This cleansing foam is a medical product that keeps your skin clean and away from acne. The scent was so good! It doesn’t sting and it really has relaxing scent like what tea tree does. This cleanser is a foamy and leaves my face squeaky clean. The cleanser was reasonable priced, not to cheap but not to expensive. It is a nicely sized product and should last for more than 4 months if used twice a day. Well, overall, this is a great cleanser for those who struggling with acne and sensitive skin! Clear Away Spot that is made to heal pimples while Spot Corrector is a concentrated essence formulated to clear pimple scars or simple blemish itself and other dark masks after the acne troubles. It also heals pimples without leaving any marks. Since they have a promo which is for every purchase of products worth Php 1,500, you will receive a special Flebote White Crystal Basic Care Set. Wow! So Ian grab this opportunity and purchase the Spot Corrector just to claim these freebies. So kahit wala sa planong bumili ng pampaganda, napabili ng di oras dahil sa galing mag sales talked ni ate.. Haha. 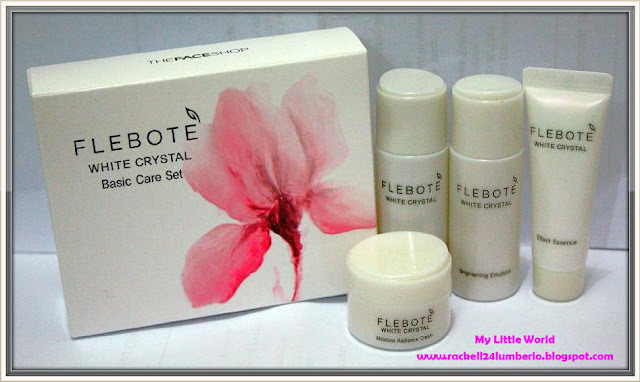 Flebote White Crystal Basic Care Set. I used this basic care set this morning, I simply follow the steps and I must say that these products satisfied my needs. 1 araw ko palang syang ginagamit, pero feeling ko sobrang lumambot and kuminis yung face ko.. Hehe. Flebote White Crystal Brightening Skin Tone – Provides for translucently clear skin tone. Flebote White Crystal Effect Essence - 86% improves in pigmentation, 81% improvement in skin brightness. Flebote White Crystal Brightening Emulsion – Lustrously glowing skin with added moisture and softness. Flebote White Crystal Moisture Radiance Cream – 82% reduction in spot, 78% improvement in skin clarity. Soak a cotton pad with Brightening Skin Tone and apply smoothly over cleansed face. After applying Brightening Skin Tone, gently apply the Effect Essence. After using Effect Essence, apply smoothly the Crystal Brightening Emulsion all over the face. Last step of my skin care; apply gently all over the face the Crystal Moisture Radiance Cream.